Right common carotid artery, which moves upward into the neck and gives off branches supplying the structures of the neck, face, and brain. Right subclavian artery, which supplies the right shoulder and right upper limb. The left common carotid artery and left subclavian artery to arise directly from the arch of the aorta to supply the similar territories on the left side. Note: The common carotid artery has no branches proximal to the bifurcation. 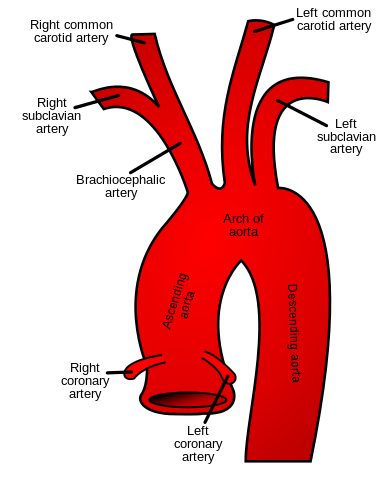 Since the left common carotid emerges directly from the arch of the aorta, it has a thoracic part and a cervical part. The thoracic part is the part of this artery found in the chest, while the cervical part is the artery located in the neck. The right common carotid artery has the cervical part only. Both the common carotids have similar relations in the neck. They move obliquely upwards towards the thyroid cartilage where they divide into external and internal carotid arteries. These pass behind the sternoclavicular joint initially separated from each other by the trachea, and later by the thyroid gland and laryngeal cartilages. 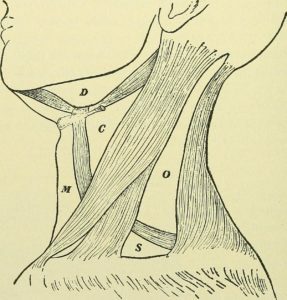 In the neck, carotid sheath (fibrous connective tissue) covers the common carotid artery, vagus nerve, and internal jugular vein. 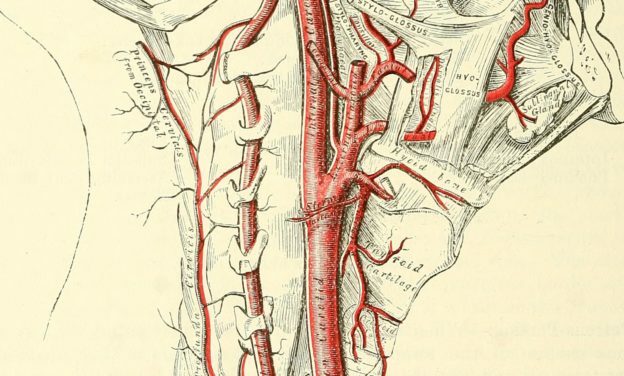 The vein is the most lateral structure within the carotid sheath, followed by the nerve and then the artery, which is the most medial structure. Each of these components of the carotid sheath has a separate fibrous compartment. The common carotid artery is covered by the superficial fascia, the platysma muscle, deep cervical fascia, and the neck muscles like the sternocleidomastoid, sternohyoid, sternothyroid, and omohyoid in the lower neck. It is relatively superficial in the upper part of the neck, covered merely by the superficial fascia, the platysma muscle, deep cervical fascia, and medial margin of the sternocleidomastoid muscle. The common carotid artery does not give any branch proximal to the bifurcation. The external carotid artery, just as the name suggests, is relatively superficial in its path and supplies superficial structures and parts of the neck and face. 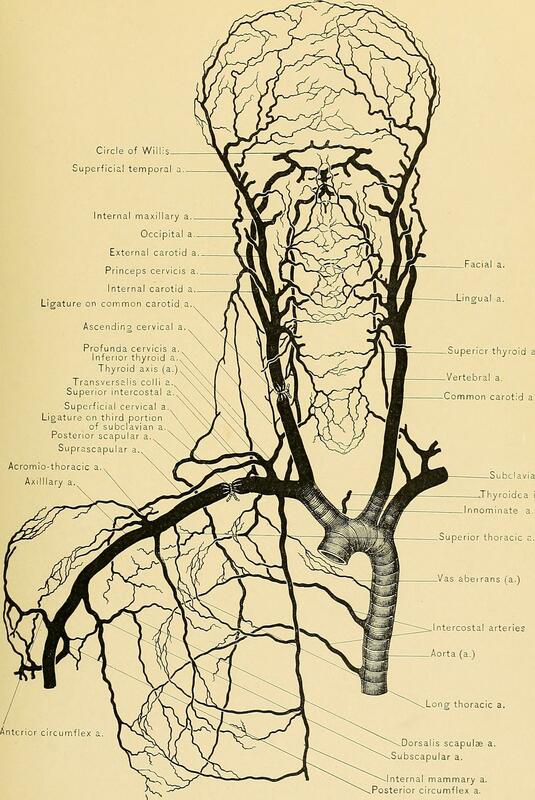 The internal carotid artery, as the name suggests, takes a deeper route and supplies structures within the brain and the orbits. It has no branches in the neck, hence, will not be discussed further in this article. The carotid body is a small, oval-shaped, reddish brown body that consists of a cluster of chemoreceptors and is present at the bifurcation of the common carotid artery. It functions as a sensor and detects changes in the arterial blood composition, by mainly detecting partial pressure of oxygen and changes in blood pH. Pulse: The common carotid artery is often used to measure pulse, especially in patients with shock and in those with an undetectable peripheral pulse. The common carotid artery is palpated below the angle of the mandible and at the upper border of the thyroid cartilage, on the anterior border of the sternocleidomastoid muscle. If a carotid pulse is present, systolic blood pressure is often estimated to be more than 40 mmHg. Carotid artery stenosis may occur in patients with hypercholesterolemia and atherosclerosis and is one of the risk factors for the ischemic stroke. Marker of atherosclerosis: The thickness of the intima-media of the carotid artery wall is a marker of subclinical atherosclerosis. This is a normal occurrence in old age. Carotidynia is a syndrome that causes inflammation and tenderness of the common carotid artery near the bifurcation. The external carotid artery is one of the two main branches of the common carotid artery; the other being the internal carotid artery. The internal carotid artery, as mentioned above, supplies the deep structures within the brain and orbits and has no cervical branches, while the external carotid artery supplies the superficial structures of the neck, face, jaw, scalp and the coverings of the brain, meninges. 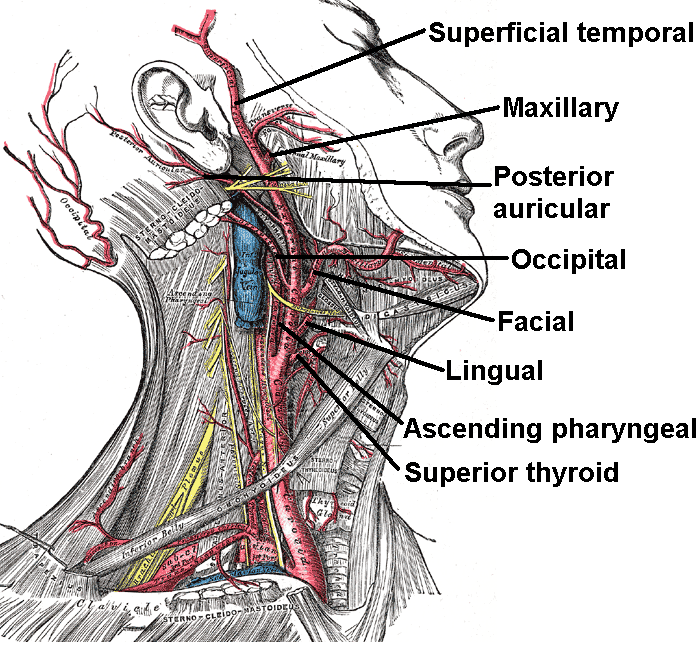 The external carotid artery starts at the upper border of the thyroid cartilage; initially, it curves upward and moves forward, later inclining backward to space just at the back of the neck of the mandible giving terminal branches: the superficial temporal artery and the maxillary artery. 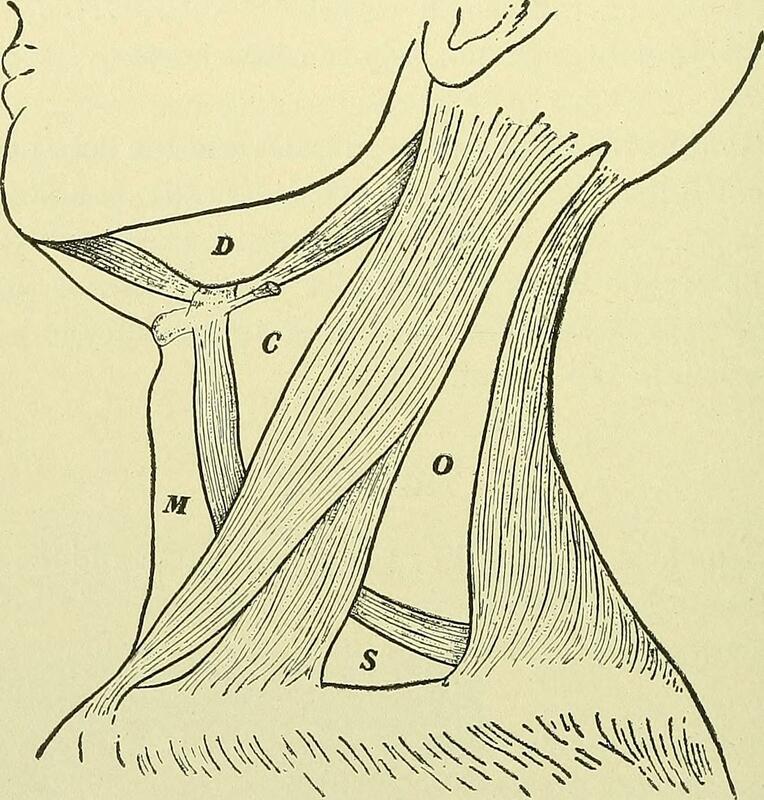 At the origin, the external carotid artery is more superficial and lies within the carotid triangle of the neck, which is a sub-triangle within the anterior triangle of the neck (labeled “C” in the image). It is bounded by the posterior belly of the digastric muscle (superiorly), the superior belly of the omohyoid muscle (inferiorly) and the sternocleidomastoid (laterally). The external carotid artery reduces in size while moving upward in the neck while giving various branches on its way. In children, it is also smaller than the internal carotid artery, but the two vessels are rough of equal size in adults. Posterior auricular artery – supplies posterior to the ear. Maxillary artery – is the larger of the two terminal branches. It has three parts and each part is further divided into multiple branches. It supplies the deep structures of the face. 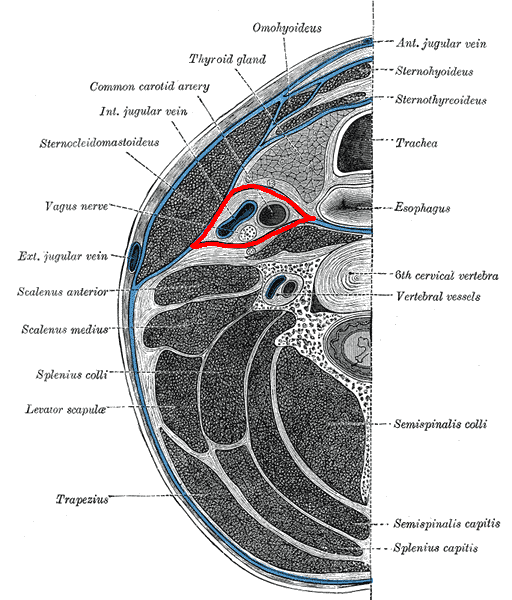 Superficial temporal artery – arises within the parotid gland and supplies part of the face and the scalp. The artery is anteriorly covered by the skin, superficial fascia, platysma muscle, deep fascia, and anterior margin of the sternocleidomastoid muscle. 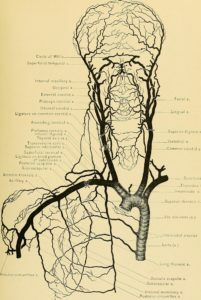 The hypoglossal nerve, the lingual, common facial and superior thyroid veins cross this artery in the neck, and the posterior belly of digastric and stylohyoid muscle crosses anteriorly. Near its origin, the superior laryngeal nerve is posterior to the artery (and then goes medially). Superiorly, it is separated from the internal carotid artery by the styloglossus and stylopharyngeus muscles, the glossopharyngeal nerve, the pharyngeal branch of the vagus nerve, and the deep lobe of the parotid gland. The hyoid bone, pharynx, superior laryngeal nerve, and the parotid gland.